Day number two of my mini-challenge brings us: Anchors Away! 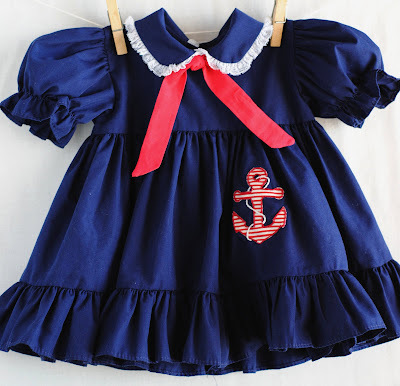 I couldn't think of anything better suited than a sailor motif for this navy blue color. Pardon all the debris showing up in the pictures - she needs a date with the lint brush - but other than that she is ready to go! The neck tie is two separate pieces attached at the shoulder seam. That way the tie won't move around and end up in the back, or get too tight around a little neck. I have no idea what day three will bring, but until then - au revoir! is this going to be for avery? it turned out so well!